Project obstacles and solutions: The City of Marion, Indiana condemned and razed an old building that had been a blighted area in the downtown region. A private law office was built on a parcel of the old property. Plans were designed for a public courtyard that could be used for various civic events on the rest of the property. Dave's Excavating submitted a design that called for a raised stage, a perimeter wall, flower bedding areas, and a large concrete courtyard. 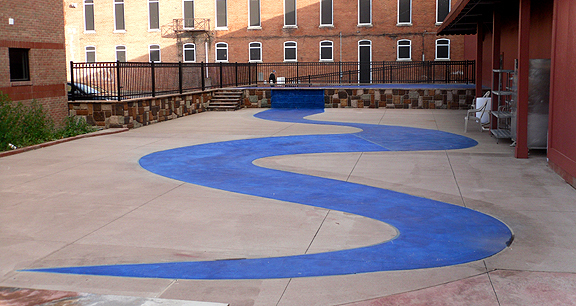 All of this was designed with imix Spectra colored concrete with acid stains applied to the surface. The City of Marion asked that a portion of their logo, which depicts the Mississinewa River, be included in the design. Dave's Excavating used acid stains to create the bright blue river symbol. They also incorporated the water theme in the stage area and created a waterfall image from the stage to the floor of the courtyard. The walls were stamped with a rough hewn stone pattern. The stone impressions were each colored individually with acid stains. IMI supplied 400 yards of imix Spectra colored concrete for this project, which won a 2012 Outstanding Concrete Award for Concrete Commercial/Industrial – Patterned/Decorative. For more information on decorative concrete and imix Spectra colored concrete,Site: click here.